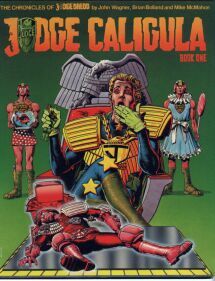 Whether you prefer to call this story 'The Day The Law Died' or the more frequently used all encompassing 'Judge Cal', there's no doubt that after Pat Mills had taken control of Dredd for the Cursed Earth saga that ran in 2000AD immediately prior to this story, John Wagner comes straight back and once again makes the character and setting of Mega-City One his own. I don't have to say how much I like the hardback editions if you want to see me in full flow on that subject have a look at the review for SlÃ¡ine the King. As usual the black & white artwork is reproduced wonderfully and these classic stories are presented at there best in these hardback collections. Back from the Cursed Earth, sentenced to 20 years on Titan for a crime he didn't commit, Dredd's character is ruined, Mega-City One is Taken over by a mad man and the story of how these two opposing driven men, one by the law and the other by madness, fight for control of the city. 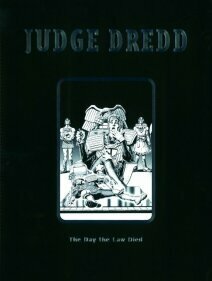 The Day The Law Died is one of those epics that doesn't rely on a huge war or big body counts for its appeal, it's a truly classic Dredd tale where the characters drive the story. The roster of artists may be this classics only downfall but when those artists include Brian Bolland, Brendan McCarthy, Brett Ewins, Ron Smith and the art of Mike McMahon at the height of his artistic powers you can forgive the differing styles because each produces some truly memorable work. After the Cursed Earth & The Day The Law Died had completed consecutive runs between Prog 61 & 108, Dredd would be 2000AD's most popular character. A mantle he has kept, and although other stories may come close from time to time, its one that he guards with 6 bullets and a day stick. The Day The Law Died is one of the early classics that ensured Dredd achieved top spot and should be a story that all Dredd fans have read.